Ballpark Estimate: 8 Million Francs (US$1.5 Million in 1890 dollars, US$34 Million in 2007 dollars). At 1,063 feet, including the antenna, the Eiffel Tower is the tallest structure in Paris and one of the most recognized tourist attractions on the globe. As the winning entry in a design competition, construction began in 1887 taking as many as 300 workmen to assemble the 18,038 pieces of a very pure type of structural iron called puddle iron. Opened in May of 1889 as the grand entrance to the Exposition Universelle, a world’s fair that commemorated the 100th anniversary of the French Revolution, the Eiffel Tower has attracted over 200 million people to marvel at its unique engineering design. In fact, in terms of paid-visitors, the Eiffel Tower ranks number one in the world. When the Eiffel Tower was first constructed, its unique design, referred to as “Victorian Structural Expressionist” by some people at the time, was highly criticized as an eyesore in a city well known for its cultural heritage. The Parisians, however, despite their disapproval of this blot on the landscape, had no choice but to wait out the 20 years when, under the provisions of the permit, the ownership of the structure transferred from its designer and engineer, Gustave Eiffel, to the City of Paris for dismantling. 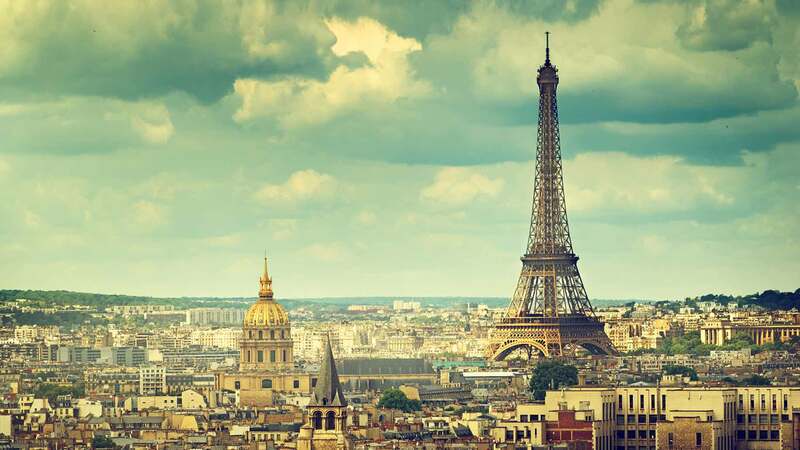 By that time, however, with the new radio technology in vogue, the French government considered the tower a valuable asset for communications purposes and the people had become so enamored with the structure that it received a reprieve. Today, the Eiffel Tower is a cherished icon of the French people. The Eiffel Tower must be painted by hand every 6 or 7 years to protect it from corrosion, a process that takes 60 tons of paint and two years to complete. The painting is usually done by a rather unique cadre of 25 painters who are unafraid of heights and possess an acrobatic agility for scaling the tower. In order to accentuate the impression of height, the tower is painted in three slightly different shades of “Eiffel Tower beige”, a color similar to milk chocolate with the lightest shade at the top. The next painting cycle is scheduled to begin around the end of 2008. To gain a little perspective on its height, if the Statue of Liberty, including its base, were to be placed on top of the Washington Monument, the Eiffel Tower would still be 200 feet taller. It cost eight million francs (US$1.5 Million 1890 dollars, US$34 Million 2007 dollars), a sum partially funded by the French government. The balance of the cost was paid with the admission proceeds going to Eiffel’s construction company. For those planning a visit to Paris the Eiffel Tower is open from mid-June to August 31 (High season) and September 1 to mid-June (Low season). And according to Eiffel Tower aficionados, the best time to see the Eiffel Tower is at night when it is lit up by 336 sodium-vapor discharge lamps which gives it a yellow-orange glow. Furthermore, to witness the most spectacular view of the Parisian skyline from the Tower is at sunset. Visitors who choose to view the splendid panorama of Paris should be prepared to confront massive crowds. First, one must find the end of the line leading to the ticket booth as it snakes around the base of the Tower. Then it’s back in line for up to 2 hours for a ride up on the elevator. Although there are four elevators that travel to the 1st and 2nd level, one at each leg, one is always reserved for the restaurant on the second level and one is for tickets to access the stairs. From the second level there is only one elevator to the observation platform. Under “normal” conditions, there is only a single admission point which rotates from leg to leg on different days. But during extra busy days, an additional elevator may also be opened. If you have an aversion to crowds, visit the Eiffel Tower during the winter when the wait is only a few minutes. As of April 2008, the price for those brave souls who prefer to climb the stairs to the first and second level is 4.0 Euros (US$6.40) for adults and 2.10 Euros for those under 25. Be forewarned, however, only the physically fit should attempt walking up the nearly 700 steps to the second level, and certainly no children. But whether you take the stairs or the elevator, acrophobia sufferers beware. Because of the open lattice framework of the Eiffel Tower, visitors will get a dizzying view of the ground below as they ascend higher and higher. In addition to the view, you experience 2 to 3 inches of sway as you climb to observation platform. For a bite to eat, there are two restaurants and a snack bar. On the mezzanine level there is a fast-food eatery where you can pick up such items as bagels, sandwiches, yogurt, etc. As one travels higher up the tower the restaurant prices rise proportionately. A typical French restaurant is located on the first level that can seat 200 diners. It’s called Altitude 95 because its 95 meters from the ground. At this restaurant traditional French cuisine is served that’s priced around US$40 per person and reservations made several weeks ahead of time is always wise. On the second level is a very small upscale establishment with a tremendous view of the city below. It’s called the Le Jules Vernes and because of its limited seating capacity and fine reputation, it’s recommended that reservations be made two months ahead of your visit. Dinner is priced at around US$200 per person. There is also a post office on the site as well as three souvenir shops. Sadly, its appeal as a romantic way to end ones life has attracted over 400 people who decided to take that final plunge.